Fireworks, clam drops, and skating! What's on your agenda for counting down 2015 with your family? We searched the area; from Biddeford to Portland to Yarmouth to Freeport. Here are Maine Doulas' top finds for the seriously cool events happening on New Year's Eve day. Steamer, the Clam Festival mascot, will be lowered from the church belfry at 7pm. Music, cookies and cocoa! What could be better (or more Maine)? 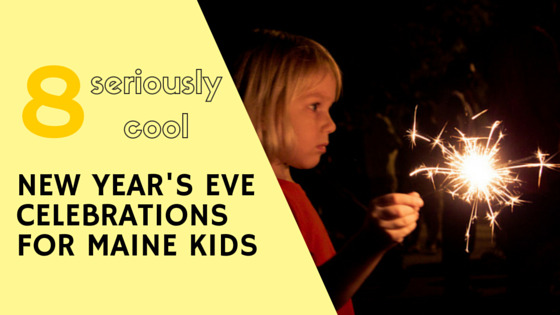 Children are encouraged to wear their PJs to ring in the new year (at noon)! This shindig is free with admission to the museum. Be sure to arrive by 11:30 to join in all the fun. At 12 noon they will drop balloons to mark the occasion. Learn a variety of fun and easy dances suitable for children and adults. Maggie Robinson, who has been calling dances for 8 years, will be the caller and local musicians will perform. No experience necessary! Contra Dance is a type of social dance where parallel lines of dancers stand opposite — or “contra to” — their partners. A caller, usually working with a group of live musicians, guides new and experienced dancers alike through a variety of dances. Contra dancing is about social interaction, meeting people, and making new friends, set to music. The accompanying music for contra dances includes, but is not limited to Irish, Scottish, and French-Canadian folk songs. The fiddle is considered the core instrument, though other stringed instruments such as the guitar and mandolin are used as well. Can’t stay awake until midnight? Come ring in the new year with our 3rd annual Noon Year Party instead! This all-ages event will take place on Thursday, December 31 from 11:30 a.m. to 1:00 p.m. at the Main Library. Featuring fun crafts, story time, balloons, and a fantastic countdown to noon, this is sure to be a blast for the whole family! Feel free to wear your favorite PJ’s, dress to impress, or just come as you are. We can’t wait to welcome in the new year with you! LL Bean always makes it exciting for the whole family. Ring in the New Year with their festive "KidNight," featuring live music from Rick Charette and a wintertime fireworks display at 6pm. There are a few venues for ice skating, which always has great opportunities for silliness and laughter. Not to mention how much energy it uses! Can you say "early night"? This is the perfect place for the whole family to enjoy some skating fun. With their beautiful warming room and heated lounge, there are great spaces for even the smallest ones to stay warm while family and friends skate. They also feature on-site food vendors and warm beverages to keep your energy up. A great NYE day adventure for everyone! Another great option for family fun. They offer snacks and cocoa to keep you skating the day away! Open for all ages and abilities. Portland Pirates' New Year's celebration from 1:20pm-2:40pm will feature Salty Pete, a Pirate's shooting bay, free food, and giveaways! Or how about these options? Cozy up with your favorite hot beverage & a winter fairy tale, or put on some festive music & have a rockin' living room dance party! Whatever you do, we hope this final celebration of 2015 brings you and your family lots of joy! Happy New Year!